Delayed Justice » » Who Killed Janet Chandler? At long last I have uploaded the entire film Who Killed Janet Chandler? to Vimeo. This film was completed in early 2004 while I was teaching at Hope College. The video file is standard definition..that was the best I had at the time in that era before high definition. It still watches just fine. The price at Vimeo is $20 for an individual copy. If you need an institutional copy…if it is going to be shown for public consumption, circulated, you need to contact me for an institutional copy: schock@charter.net. HOLLAND – A visit with local law enforcement led a Hope College documentary class to investigate the unsolved abduction and murder of one of the college’s own a quarter century before. The resulting 80-minute program, “Who Killed Janet Chandler?,” will premiere at the college’s Knickerbocker Theatre on Wednesday, Jan. 28, and continue on Thursday and Friday, Jan. 29-30, at 7 p.m. Law enforcement representatives have indicated that they will be present at the Jan. 28 showing. The documentary will also be presented on WGVU-TV of Grand Rapids on Sunday, Feb. 1, at 1 a.m., 25 years to the hour of the discovery of Chandler’s body. Chandler, a Hope senior from Muskegon, was abducted on January 31, 1979, after 1 a.m. while working the night desk at the former Blue Mill Inn near U.S. 31 and 16th Street in Holland. Her body was found almost 24 hours later by a snowplow driver in a wooded turn-around on Interstate 196 seven miles south of South Haven. Local, state and federal law enforcement agencies all became involved in the investigation, but the crime was never solved. 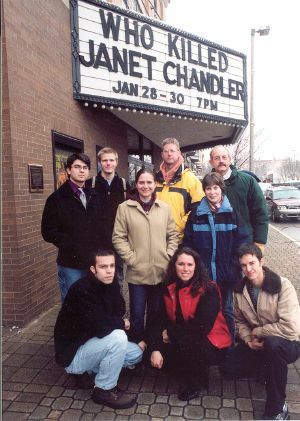 Schock proposed the story – of the crime, of Chandler, of the investigation and the aftermath – to his fall, 2003, documentary class. After first obtaining Chandler’s parents’ consent to pursue such a project, they worked on it together throughout the semester, with Schock and lead videographer Phil Blauw of the Hope staff continuing to collect material and edit the program through to the present. “In the process we talked with those who served on and directed the original investigation, those who now carry the case as a part of their workload, some of those who taught Janet and knew a part of her, members of her family, and some who her murder affected,” Schock said. Schock would also one day like to include details about the crime being solved. It is with that hope that he and the students have stayed with the project, as painful as it has often been. The Hope communication students, all juniors, who participated in the documentary project included: Olim Alimov of Tajikistan; Tyler Basler of Auburn; Sarah Hartman of Richmond, Ind. ; Wes Hollendonner of Akron, Ohio; Jonathan Johnson of Fremont; Amber Ross of Schiller Park, Ill.; Amy Schlusler of Lapeer; and Kyle Shepherd of Oak Forest, Ill.
A Hope documentary class’s investigation of the unsolved abduction and murder of a student a quarter century before has played a role in prompting law enforcement to take a new look at the crime. During a press conference at Holland City Hall on Wednesday, April 28, the Holland Police Department, Michigan State Police and Ottawa County sheriff and prosecutor’s office announced the formation of a “cold case” team to investigate the 1979 murder and abduction of Hope senior Janet Chandler of Muskegon, Mich. Chandler was abducted on January 31, 1979, after 1 a.m. while working the night desk at the former Blue Mill Inn near U.S. 31 and 16th Street in Holland. Her body was found almost 24 hours later by a snowplow driver in a wooded turn-around on Interstate 196 seven miles south of South Haven. Local, state and federal law enforcement agencies all became involved in the investigation, but the crime was never solved. It is the city of Holland’s only unsolved homicide. During the fall and early spring of the past school year, the college’s documentary class, taught by Dr. David Schock, associate professor of communication, prepared an 80-minute program about the crime, its investigation and its aftermath. Who Killed Janet Chandler? debuted in January at the college’s Knickerbocker Theatre and showed subsequently on local public television. Local and regional media also published accounts of the student program and the crime it examines. Law enforcement officials credited the documentary with building public awareness, which they called a key component in a cold case investigation. “The more we show this case in the media, the more optimistic I am that we can solve it,” said Lt. John Slenk of the Michigan State Police. Janet Chandler’s father James thanked the Hope film makers for bringing the crime to the fore. The multijurisdictional team will be working full-time on the case. Slenk described such investigations as slow-moving, anticipating that the work will take at least half a year. Based on the state team’s success since 2000–solving eight out of eight cases–he is confident of success. “Every case we’ve investigated we’ve solved, so I’m pretty optimistic we can make this work,” he said. The cold case team has announced two numbers that can be called by those with information relevant to the case, a “tip line” at (877) 443-8477 and Silent Observer at (616) 392-8477. The Hope communication students, all juniors, who participated in the documentary project included: Olim Alimov of Tajikistan; Tyler Basler of Auburn, Mich.; Sarah Hartman of Richmond, Ind. ; Wes Hollendonner of Akron, Ohio; Jonathan Johnson of Fremont, Mich.; Amber Ross of Schiller Park, Ill.; Amy Schlusler of Lapeer, Mich.; and Kyle Shepherd of Oak Forest, Ill. Lead videographer for the project was Phil Blauw of the Hope staff. Several of the students were able to attend the press conference. They noted that they appreciated seeing their work have an impact, especially given the impact of the project on themselves. “It’s very powerful–a student investigating a student’s murder, it’s very moving,” Shepherd said. LANSING — Attorney General Mike Cox today announced that Three Oaks (Michigan) resident Robert Michael Lynch, 66, has been bound over for trial by Judge Bradley Knoll, 58th District Court in Ottawa County, for the 1979 death of Hope College student Janet Chandler. Lynch will face trial on first-degree murder charges which were issued jointly by Cox and Ottawa County Prosecuting Attorney Ronald Frantz. This cold case homicide was solved by a cold case investigative team comprised of both Michigan State Police and Holland Police detectives. The Court heard testimony that in 1979, Lynch was employed as a security guard on assignment at a local labor strike. Lynch was temporarily living at the Blue Mill Inn along with many other fellow guards. At the exam, a fellow guard testified that he observed Lynch choking Chandler as she fought with him. Chandler was restrained in a chair and her face was taped. Police later testified that Lynch told them he was an active participant in orchestrating Chandler’s staged abduction and murder. Police also testified that Lynch told them that he had sexually assaulted her. Lynch also allegedly told police that he later discarded Chandler’s body adjacent to a snow-covered freeway median. The 23-year-old Chandler disappeared while working the night shift at the desk of the Blue Mill Inn in Holland on January 31, 1979. She was discovered missing when Holland Police responded to a robbery call from the Blue Mill Inn. A snowplow driver discovered Chandler’s body nearly 24 hours later adjacent to a turn-around on I-196. This case is the latest assigned to the Attorney General’s Office of Special Investigations, formed by Cox in 2003 to investigate and prosecute public corruption cases and cold case homicides. The unit has conducted more than 50 public corruption investigations and convicted serial killers Coral Watts and John Rodney McRae. A criminal charge is merely an accusation and the defendant is presumed innocent unless proven guilty beyond a reasonable doubt. For more information, contact Ron Frantz, Ottawa County Prosecuting Attorney, at (616) 846-8215; Craig Bunce, Assistant Ottawa County Prosecuting Attorney, (616) 392‑1446; John A. Kruithoff, Chief of Police, Holland Police Department at (616)355-1120; Major Barry Getzen, Michigan State Police at (517) 336-2000; Rusty Hills or Nate Bailey, Office of the Attorney General at (517) 373-8060. In the interim there were five more arrests: Laurie Ann Swank, Janet’s roommate and boss at the Blue Mill Inn, Arthur Carl Paiva, the head of the Wackenhut strike detail, and Wackenhut guards Anthony Eugene Williams, James Cleophus Nelson, and Freddie Bass Parker. Lynch and Swank pled guilty to charges of less than first degree murder. The other four went to trial in October of 2007 in an Ottawa County courtroom in Holland. All four were found guilty of first degree felony murder and received mandatory life sentences. But this case is still an active murder investigation. Our hope is the all guilty parties will be brought to justice through the efforts of the Cold Case Team and the prosecutors. We realize that we’ve played a role in this project, an important role, but there is no question that the team of investigators and prosecutors have made justice, even delayed justice, possible. Many correspondents have wanted to know our take of the Dateline piece that ran May 23, 2008. Without doubt this is the finest and most sensitive telling of this story I could imagine. Producer Jack Cloherty lived with this story for more than two years following the first arrest in the case. Mr. Cloherty is a talented writer/producer who is ethical, honest, sensitive and true to his calling. We were thankful for his precision and care.